There are many different barefoot trims within the field of natural hoof care, some of which embody completely different approaches. How can we know which one is best for a healthy barefoot horse? 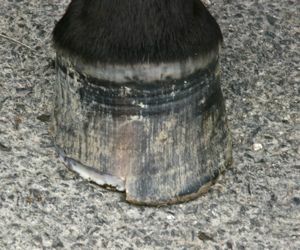 This is our own experience of finding a real hoof trimming solution. It took many years after we first went barefoot with our horses to discover the barefoot trim which we feel is ideal for healthy hooves and the horse's comfort. When we first stopped shoeing our horses - well over ten years ago now, when we still lived in Scotland - it was more through necessity than design. Back then, like most horse-owners, we were completely unaware of how damaging shoeing is, but our farrier damaged his back, and we were unable to find a replacement. We were forced to consider leaving the shoes off, and doing our own hoof trimming. We quickly realized that, although previously we had always shod horses in work as a matter of course, in fact it was really unnecessary, considering that we mostly worked our horses in a soft arena. At the time we had quite a few young horses who were not shod, but the farrier's trim they received was always an ordeal because he was not patient enough, and often lost his temper if they didn't cooperate. At least doing our own trimming meant that we could take more time and handle the youngsters in a more sensitive way. At that point, our only knowledge of hoof trimming was from observing the farrier's trim, this was before natural hoof care had become popular, and we were oblivious of the whole realm of specialist barefoot trimming. So our early hoof trimming was very rudimentary, and certainly not regular enough either. We were also ignorant of the importance of the barefoot horse's diet, and in Scotland the combination of rich grass in summer, and extremely wet conditions in winter, certainly didn't do our horses' feet any favors. 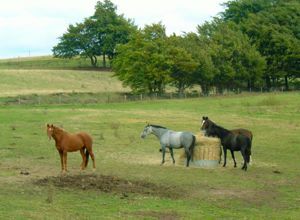 Due to the poor quality of hay available in Scotland's wet climate, we were often obliged to feed haylage (not beneficial for the horse's gut and consequently feet), and we used hay-feeders, which meant that in the winter the horses spent the majority of their time standing still in wet ground - not good for healthy hoof stimulation. We are still dealing with the consequences of this now with the horses we have who grew up in those conditions - although most of the hoof wall deformity has disappeared, many years later many of them still have weak frogs and digital cushions. Go to The Horse Diet and its Importance in Hoof Care for more information about the barefoot diet. Unfortunately, it would not be until many years later that we discovered Paddock Paradise as a solution for managing the barefoot horse diet and lifestyle. Since we constructed our own Paddock Paradise system here in France (photo left) it has revolutionized our horses lifestyle and diet. When we first moved to France, to a much drier climate, our horses' hooves had to adjust, and at first we had a lot of cracking and breaking off of the hoof wall which was not used to the hard ground and dry conditions. It was not long after this that we had our first exposure to specialist barefoot trims after attending a near-by clinic given by an Australian barefoot trimmer of some renown. This in-depth, specialist approach to hoof trimming was a real eye-opener for us at the time, and we were keen to apply his technique to our own horses. It so happened that this particular barefoot trim was based on a very mechanistic approach to the horse's hoof, probably explained by the engineering background of the barefoot expert in question. It was an approach based on imposing certain predetermined geometrical principles on the hoof, which involved some quite severe removal of hoof wall (photo right), as well as frog material. 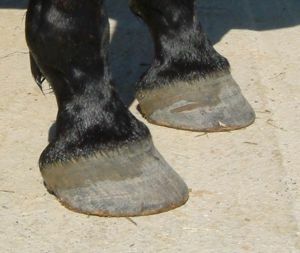 Like many barefoot trims, this technique advocated taking the distorted hoof right back to its 'correct' shape in the space of one trim, with no time for a gradual process of adjustment. Our horses hooves at the time, even though they had been barefoot for some years, had a considerable amount of flaring and general distortion. Applying this particular method meant cutting the hoof wall right back into the white line, often up to the edge of the sole, thereby removing all weight-bearing support and protection normally provided by the hoof wall at ground level. ALL flaring of the outside of the hoof wall was to be removed, which meant rasping considerable amounts of horn off, up to two thirds up the hoof wall. Paring of the frog to remove any material that was unhealthy or apparently extraneous was also part of this barefoot trim, and for our horses who's feet had suffered for years in wet conditions, this often meant extensive removal of the tissue of already weak frogs. The difference in appearance that this new hoof trimming technique made to our horses' hooves was striking - suddenly they looked perfectly shaped, neat, smooth and regular. But what we had not realized was that we were artificially imposing an appearance of health onto our horses hooves from the outside, when this health can only genuinely come from the inside. The price we payed for this was that our horses were becoming more and more sensitive in their feet, and this was actually inhibiting any real improvement in the hoof structure. Hooves need stimulation above all to become healthy structurally, but stimulation goes hand-in-hand with comfort (if you've ever had, for example, sensitive teeth, or a bad headache you'll know that the last thing you want to do is stimulate the area of discomfort in any way). Due to this aggressive barefoot trim, our horses' feet were far from comfortable at this point. The barefoot expert who's method we were following at this point, on top of the invasive trim, also advised working horses (barefoot) on a hard surface, such as tarmac, in order to 'toughen them up'. He even recommended cantering on the road as much as possible. 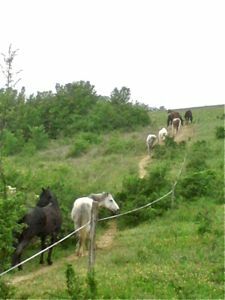 Not knowing better, we tried to follow his advice, but the horses became more and more resistant to going on hard surfaces, always seeking out the grass verges. Although it took some time for us to become fully aware of it, our horses were actually holding themselves increasingly stiffly in response to the discomfort of their feet. Thankfully, we were to meet another barefoot trimmer who was able to put us back on course. It wasn't until we had been following this mechanistic barefoot trim for over a year, even hosting two clinics with him at our yard, that we were to be shown another way - ironically by a fellow Australian, Tara Calvert-Jackson whom he had brought with him as an 'apprentice'. She had been traveling with him to gain experience, and was actually shocked at what was being done to horses' feet under the auspices of his expertise. Tara's background, instead of engineering, was in studying horses' movement in terms of their feet. This led her to discover that hoof comfort is the number one priority for healthy heel-first landing in movement, and that heel-first movement equals healthy stimulation of the hoof, which promotes healthy structures, and in turn gives leads to increased comfort. 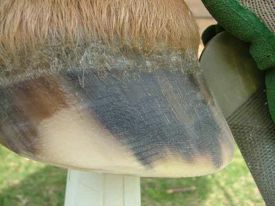 The important point is that this positive circle can only come about if the hoof trimming method does not lead to increased sensitivity in the hoof. In comparison to farrier trims and more invasive barefoot trims, the natural trim (left) respects the integrity of the hoof capsule, taking away only what nature would by healthy wear if the horse were in its natural environment. It emulates the form of the wild horse hoof without imposing a rigid geometry, allowing good form to develop from the inside out. 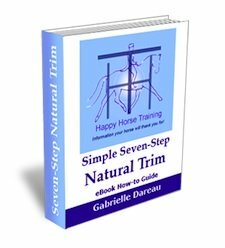 Go to The Natural Trim: The Solution For Healthy Horse Hoof Care for more on this trimming method, and how you can learn to do it yourself. We realized straight away the importance of what Tara was saying, because it made sense of the experience we were having with the other barefoot trim method. Straight away we changed our trimming technique to a much more gentle and organic approach, which takes into account the fact that the hoof is part of a living organism, it is not a mechanical object. 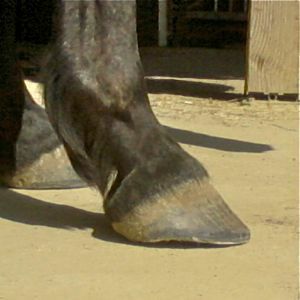 Apart from the trimming technique, Tara also stressed the importance of hoof boots in providing the protection the barefoot horse needs to move comfortably, and therefore stimulate the hoof structures in the right way. 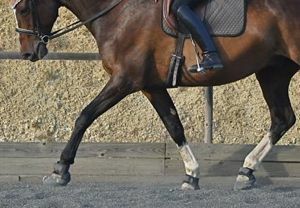 Her motion studies had shown that even on a soft arena surface the protection of hoof boots makes a significant improvement to heel-first landing. Logistically, it was a big step for us to consider using hoof boots, in terms of the number of different horses we would need to fit them to, and the additional time taken to put them on every riding session. 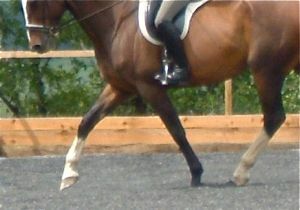 We decided to go for it though, and what a difference we felt in the horses the first time we used hoof boots! It was as if they suddenly felt operational again, and no more desperate clinging to the grass verge when riding out on the roads. It would take some time for the horses to completely let go of the tension that had crept in to their bodies as a result of sensitivity in their feet, but with hoof boots we certainly knew we were on the right track. These pictures show the same horse before and after using boots. The top photo clearly shows the toe-first landing the horse makes when its feet are not sufficiently comfortable and protected. Different Barefoot Trims: Very Different Results! We have now been using the natural trim on our horses - of many different hoof types and histories - for more than four years, and the gradual transformation that has taken place in their hooves is quite amazing. 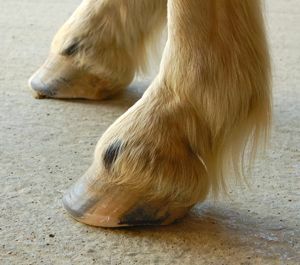 Whereas before we tried to get rid of flaring, stretching of the white line and so on by artificially removing it, now these distortions have disappeared naturally, because the hoof is growing healthily from the inside. The natural barefoot trim's method of maintaining good hoof balance, which is very different from the ordinary mechanistic approach, has also yielded very positive results - even in horses with conformational limb deformities. This barefoot trim's minimal approach has proved to us that sometimes less really is more! Before, we tried to go directly for the end result - to 'make it happen', and only ended up with weakened hoof walls that were often so thin after excessive rasping that they literally bulged under the horse's weight, and resulting in the sensitive structures within the hoof being left without adequate protection. With the natural trim, we actually achieved the result we wanted, but by being patient and taking into consideration the whole picture, which includes, very importantly, the horse's comfort. In our journey to natural hoof care we went from one extreme of too little attention and understanding, to the other extreme of an invasive, mechanistic approach, but on the end we found a middle way which has made a huge difference to the overall health of our horses, not just their feet. We don't really regret having gone down the 'wrong' path in terms of barefoot trims initially, because we learned so much about the value of the respectful approach from the experience. For us, our experience of discovering natural hoof care and different barefoot trims shows the importance of being prepared to keep evolving your ideas, no matter how much you think you've arrived at the right conclusion. If you really want to learn, life tends to bring you the opportunities you need, you just have to be open-minded enough to take them on-board. If you would like to contribute your own experience of barefoot hoof care, and create your own page on Happy Horse Training, go to: The Barefoot Horse Revolution: Share Your Story! and fill in the simple form.